After serving as outside counsel to Post Acute Medical since 2009, Rob Tribeck joined the Company as Senior Vice President and Chief Legal Officer in January 2015. As Chief Legal Officer, Rob is responsible for the overall operations of the Legal and Compliance Departments, including mergers and acquisitions, contracts, compliance, regulatory, litigation, and employment matters. He has over 20 years of legal experience counseling business clients of all sizes. 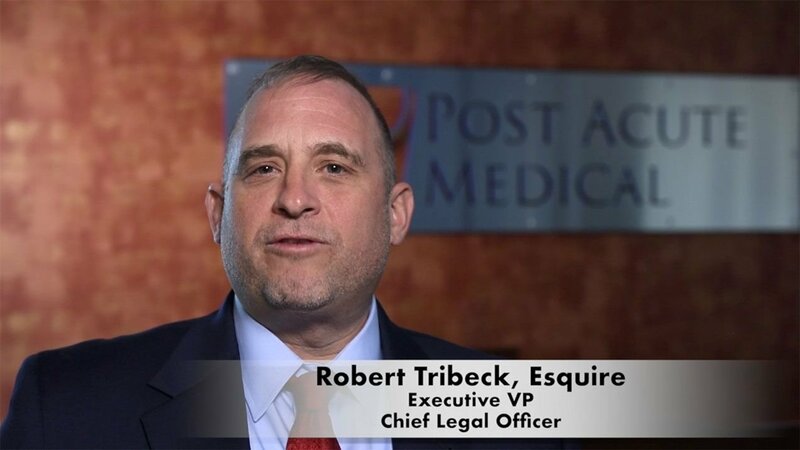 Rob joined Post Acute Medical from a large Central Pennsylvania-based law firm, where he practiced since 1996 and served as Chair of its Litigation Department and as a member of its executive committee. Rob is a graduate of Pennsylvania State University and the Ohio Northern University Pettit College of Law, where he was Editor-in-Chief of the Law Review. After graduation, he was appointed to and served a Federal Judicial Clerkship with the Honorable William W. Caldwell from 1994 through 1996.